Description: CSX ES40DC 5225 leads X091 (Southbound Lite Power) through Glendale. CSX 7904, CSX 8642 and UP 4016 are trailing. Description: A nice looking GEVO in that "golden hour" of morning sunlight. Description: CSX Q365 crosses Pump Road at 46 MPH with a total axle count of 586! Description: CSXT 283 as the second unit on CSX Q365. Description: All 4 locomotives on CSX Q365 at QC 309. Description: CSX Q438-17 gets back on the move east with CSX ES40DC 5225 leading. Description: Train came from the Fitz, then got a new crew at Rice Jct, for the leg to Savannah. 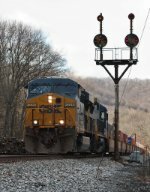 Description: A westbound mixed freight train catches some late-day sun as it rounds the bend at the Amtrak platform in Connellsville. Description: Westbound CSX train Q703 with 5225 leading goes in on number 1 track at the eastbound home signal at Rossville interlocking, Pholadelphia Subdivision. Description: Q438 passes the old B&O color position signals at Mead. The tower to support the new signals was just set in place.